Advantages: Continues the neglected story of the Luftwaffe anti-shipping units including aircraft, systems and tactics, intruder operations; concise and interesting narrative; large, relevant photos; great profiles - terrific inspiration for modellers. 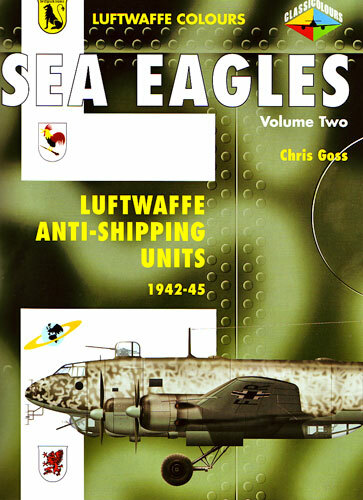 Classic Publications has now released "Sea Eagles, Volume Two", covering Luftwaffe anti-shipping operations from the period 1942 to 1945. The early days of these units was less than glorious, but the mid-war years saw more success for these maritime Staffeln. With the German offensive stalled in the East and the American industrial juggernaut entering the war, it became imperative for resources to be directed to the destruction of Allied Arctic convoys supporting the Soviet Union. This task was partly the responsibility of Luftwaffe aerial torpedo units operating Heinkel 111 and 115 aircraft. The Luftwaffe also supported the North Atlantic U-Boat offensive in the form of Fliegerfuhrer Atlantik, and in the Mediterranean, two specialised Gruppen were committed, plus a number of conventional bomber Gruppen equipped with the Junkers Ju 88. With these resources in place, March 1942 saw a major escalation in Luftwaffe anti-shipping operations and successes. This title covers the build up of anti-shipping units, their training and the heady successes of 1942, through the turning point against the Luftwaffe during 1943 and the inevitable downward spiral in the final years of the war. The book comprises 96 pages in the familiar large format (303mm x 206mm) of the series. Around 200 photos, mostly of the aircraft of the period, are one of the highlights of this title. Captions are detailed and relevant, and provide useful information about the colours and markings of the subjects. Plenty of first-hand accounts from both sides of the conflict are supplied to put the technology into a human context. The side profile illustrations are very attractive, and cover a wide selection of mid to late war maritime aircarft and bombers. These include Junkers Ju 88, Ju 188s and Heinkel He 111s from bomber units in a variety of interesting hybrid camouflage schemes, through to the impressive but flawed Heinkel He 177 Greif, and more specialised maritime aircraft such as the Focke-Wulf Fw 200 Condor and the He 115. Air-launched torpedos and guided bombs are also covered in this title. The operations, equipment and personnel of the Luftwaffe Anti-Shipping units has long been neglected. It is very pleasing to see Classic Publications apply its attractive and effective style to this important corner of aviation history.